(Left to Right) Will Poulter as Gally, Thomas Brodie-Sangster as Newt, Dylan O’Brien as Thomas. Director Wes Ball. Photo courtesy of Fox Entertainment Group. In 2011, when an unknown short film entitled Ruin roamed the internet, it caught the attention of the studio executives at Fox, which led to the discovery of such a talent in Florida native, director Wes Ball. 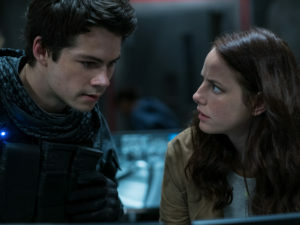 As Initial meetings ensued between the director and the studio, simultaneously someone had handed him The Maze Runner book and asked him what he would do with it. The newcomer immediately took the book home, fell in love with the concept, and then came back and pitched it, explaining how it resembled the brotherhood in Lord of the Flies along with supporting images. This leap of faith from the studio jumpstarted Ball’s Hollywood career to direct the entire Maze Runner franchise which includes The Maze Runner, Maze Runner: The Scorch Trials, and Maze Runner: The Death Cure. It’s a rare sight to see one director attached to an entire trilogy series, let alone a first-time director. This places Ball in the esteemed company of the greats, such as George Lucas and Peter Jackson. The Maze Runner books are written by novelist James Dashner. The novelist gave free reign to the screenwriter T.S. Nowlin and the director to make whatever adjustments necessary. 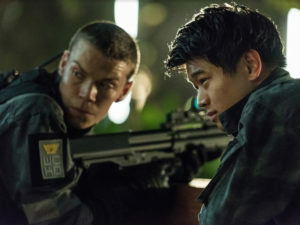 The core cast in the three films comprise of Dylan O’Brien as Thomas, Ki Hong Lee as Minho, Thomas Brodie-Sangster as Newt, Kaya Scodelario as Teresa, and the return of Will Poulter as Gally along with additional characters throughout. Dylan O’Brien as Thomas (left) and Kaya Scodelario as Teresa (right). Photo courtesy of Fox Entertainment Group. Pleasing the fans of the books is of top priority and perhaps the most challenging aspect in any adaptation. “The fanbase is the reason we have the series. It was important for me to not betray them, to not change the book so much that they felt like we disappointed them,” Ball emphasized. Will Poulter as Gally (left) and Ki Hong Lee as Minho (right). Photo courtesy of Fox Entertainment Group.